In close reviews, a post flagged as a duplicate and the claimed duplicate target are rendered as tabbed pages so that reviewer can compare them without leaving the page. However, the tabbed pane is missing in this close review. The auto-generated dupe comment has a score of two. However, when the "Close" dialog doesn't display the dupe target shown in the comment. After click "Close" in the "Close" dialog, it turns out that it's just a review-audit. From this, one can conclude that in a review-audit, a review target flagged as a duplicate won't have the "Duplicate" tabbed pane. In this case, this conclusion helps the reviewer know a priori that the review is actually a review-audit. Not the answer you're looking for? 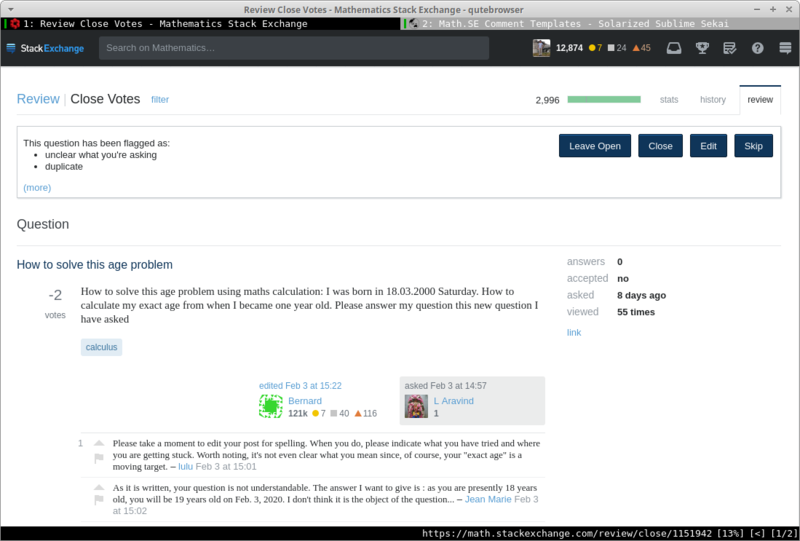 Browse other questions tagged bug review closing user-interface .